The second Chicago Food Swap took place today, St. Patrick’s Day, and it was a huge success! I am still glowing from the foodie love. After the December food swap, which was small but fun, my co-founder, Chef Druck, and I had looked around in vain for a more centrally located space that we could use. Our problem was price. We wanted to pay nothing. Every space we talked to wanted us to pay something. Chef Druck and I are passionate about the food swap but we are also adamant about not charging our swappers a registration fee, so paying hundreds of dollars for an event space was simply not feasible. When no free space emerged, we decided to try the swap again at our previous location: the basement of the Forest Park craft boutique, Pretty Little Things. The owners of Pretty Little Things, sisters Signe and Binky, could not have been more supportive of our efforts and we love them for it. Pretty Little Things has adorable, handmade clothes and home furnishings — I actually bought an organic cotton blanket for a baby present while I was setting up for the swap — which is really in keeping with the whole zeitgeist of the food swap movement. I encourage locals to check it out. Between December and now, the word had started to spread about the Chicago Food Swap and the response was exciting. We had twice as many swappers today as we had last time. Table space was at a premium. And the offerings were diverse, ranging from flavored syrups to chocolates to jams to baked goods to spice mixes and even alcoholic infusions! This time, it was a true swap. In December, everyone had ended up trading with everyone else because we were such a small group. Today, by contrast, there were a few items that we in high demand and negotiations got intense. But everyone was very polite and there was plenty of interest to go around. I brought some cherry syrup that I had made with frozen sour cherries from last summer. (I used this recipe from Madhur Jaffrey and it’s a keeper. I served the syrup to my friends Friday morning with ice and seltzer and let me tell you, it was delicious.) I also brought some cranberry orange bread and some of my jams and jellies from last summer. Zuzu also got into the act and whipped up a batch of my grandmother’s famous Halfway Cookies as her swap item. Zuzu’s Halfway Cookies were in high demand. She netted two bottles of chocolate syrup, a beautiful bottle of Tahitian vanilla syrup — what does she think she is going to do with it? — and — the main prize — a homemade version of those iconic Hostess chocolate cream-filled cupcakes. My haul was even more impressive: curry powder mix from my Sri Lankan cooking class instructor, English toffee, truffles, salad dressing, limencello (! ), jalapeno jam, strawberry-rhubarb-orange jam, blueberry port mustard and more. And I missed out on the lemon and orange curds, the ketchup from Chef Druck and her daughter and the cheddar-scallion monkey bread! But that gives you a sense of the array of offerings. I think all of our swappers had a good time and enjoyed the beautiful array of goods. Many expressed their interest in doing it again. My friend Melisa, who came with her sister, wrote an enthusiastic recap on her blog. I’m glad to hear it because in the past few weeks, we’ve had at least two store owners express interest in hosting a swap at their place. Although we are very grateful to Pretty Little Things for their gracious hospitality, Chef Druck and I really like the idea of moving the swap around the Chicago area to reach the most people. If you want to stay abreast of the latest swap happenings, be sure to “like” our Facebook page and check out our website. We hope to host another swap in May and you definitely don’t want to miss it! If you aren’t in the Chicago area, don’t despair. There are food swaps popping up all over the country. Many cities, including Los Angeles, Austin and Brooklyn have very well-established food swaps. 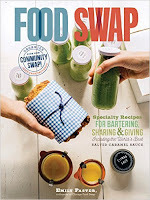 To find a food swap in your city, check out the Food Swap Network, which lists as many food swaps as it can all over the United States and internationally. No swap in your town? Start one! The Food Swap Network will help you get started. This was so fun. We're still talking about it over here.